January 26, 2011 - Allegiant Airlines has received on Tuesday notification from the National Mediation Board (NMB) that the Transport Workers Union (TWU) failed to obtain the support of a majority of employees voting in the dispatcher election and thus, Allegiant's dispatchers will remain non-union. This is the first time Allegiant dispatchers have voted on union representation. "We are pleased our dispatchers have chosen to maintain a direct relationship with company management rather than through a third-party representative," Maurice J. Gallagher, Jr., Allegiant CEO and Chairman, said. "Because of Allegiant's unique business model, we believe a direct relationship is always in our employees' and the company's best interest, and look forward to continuing to work directly with our dispatchers on matters of concern to them." Back in December Allegiant Air 400 flight attendants voted yes for union representation and will join Transport Workers Union. The flight attendants scored a great victory as an overwhelming majority voted to join the TWU, 220 to 137, and will now gain collective bargaining rights. They were the first flight attendants to vote for union representation under the new federal rules that call for a simple majority in airline and railroad union elections. ?Allegiant is a good place to work, and now it?s going to get better,? said Kristi Cohen, an Allegiant flight attendant who is also based in Las Vegas. ?Now we?ve got a voice on the job, which means we can do an even better job of providing great service to our customers. Once we can negotiate about our schedules, work rules, and other issues, we?ll be full partners in growing the business.? The flight attendants are the first work group at Las Vegas-based Allegiant Airlines to unionize. They will join the more than 9,400 TWU flight attendant members who work at Southwest Airlines and enjoy an industry-leading contract. ?This is the reason you get involved in the union movement, to help more workers have a voice,? said TWU International President James C. Little. ?We?re excited to welcome a terrific group of workers to the TWU family, and to build on the success we?ve had at Southwest.? Allegiant managers, Little said, ?ran a very aggressive ?Vote No? campaign, which is typical of most employers. Allegiant flight attendants did a great job standing up for what they believe in.? The Allegiant flight attendants are now working towards securing a decent contract that provides job security, wages, benefits, work rules and sick leave. ?With the victory, the TWU will continue to increase its presence and role in advocating for flight attendants and airline employees on issues impacting the airline industry ranging from health and safety to company mergers?. Allegiant Air is an American low-cost airline owned by Allegiant Travel Co. (NASDAQ: ALGT) that operates scheduled and charter flights. It is a publicly traded company with 1,300 employees and one billon USD market capitalization. The corporate headquarters is in Enterprise, unincorporated Clark County, Nevada. 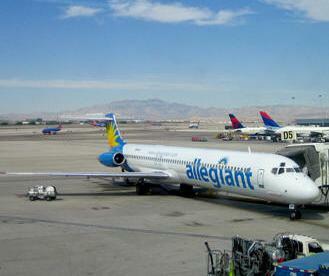 The airline also offers vacation packages through its Allegiant Vacations affiliate.